It’s been decided. My next guitar will be a 12-string dreadnought. I’ve procured some red cedar for the top and walnut for the back and sides. Since I’m getting this from an alternate source than LMI, it won’t be joined, thickness sanded, nor bent. Hence all the activity trying to build a bending machine. 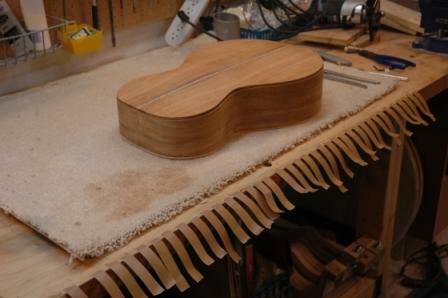 I’ve chosen curly maple for the binding and some interesting purfling and matching backstrip. 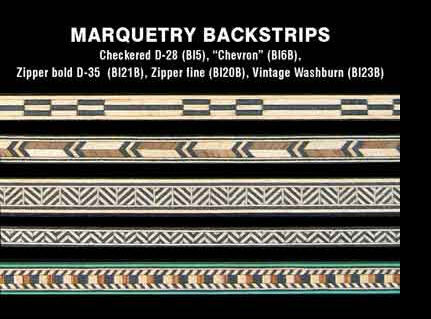 Second from the top will be the backstrip. 4th from top will be the purfling. 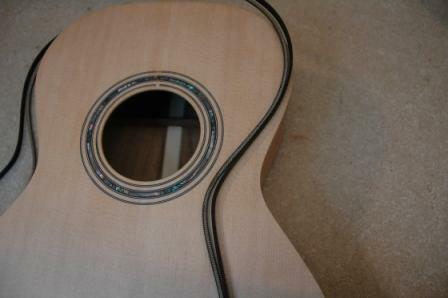 I’ll bind the fretboard with ivory, use Grover Chrome mini tuners, and abalone shell rosette. I’m going to also accent all binding both top and back with a B/W strip. I have dreadnought plans, but I’ll need to build molds and forms for the bending machine for the dreadnought body size. I’ve got a jumbo Taylor 12 string and I’ve been peering inside to see what adaptation to braces is warranted for a 12 string and the extra tension created with 12 string pulls vs. 6. What I’ve seen so far is beefier braces and a thicker bridge plate. 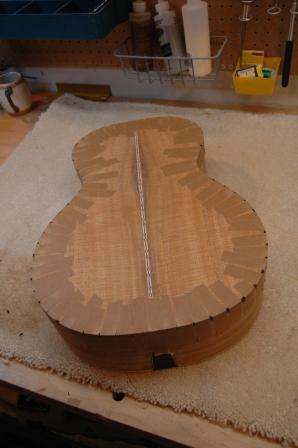 I suspect a wider fretboard, but haven’t measured yet to compare to plan dimensions. 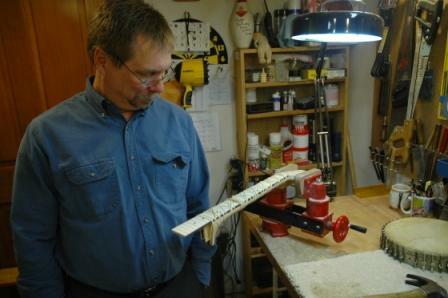 Larry’s worried, he thinks I’ll neglect his guitar to work on the new one. I’ll try not to get distracted with new work. I’ve got some sanding to do on Larry’s guitar, but now that the spray booth is ready, I’m very close to applying stain and beginning the application of lacquer. Last night Larry came by ostensibly to play music, but I ended up recruiting him to help finish the spray booth installation. 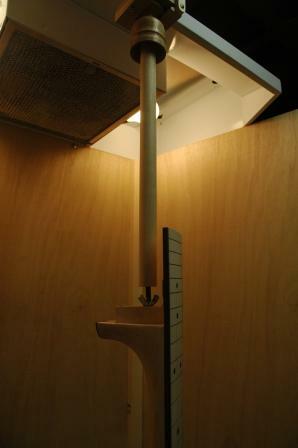 I crafted a booth by building a platform (table) with 1/8″ plywood trifold with a range hood mounted on the top. 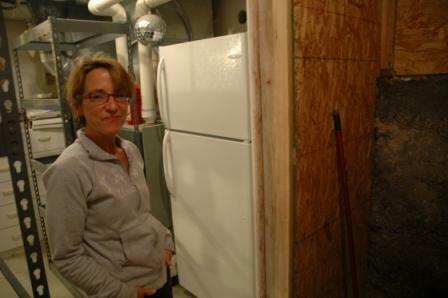 I measured for the location of the vent through the wall to the outside, drilled and chiselled it out inside the house and outside the house and had Larry feed the vent tube from the outside while I lined it up with the hood duct then duct taped it in place. 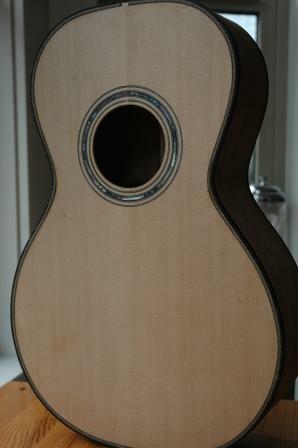 We spent the rest of the evening sanding and filing the neck (me) and sanding down the body (Larry). 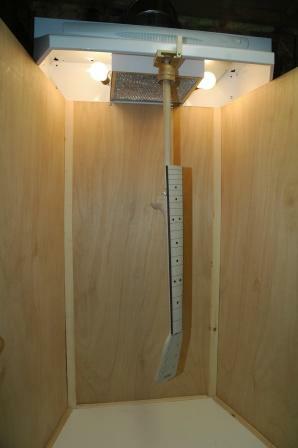 Today, I finished crafting a device for hanging the guitar body and neck. 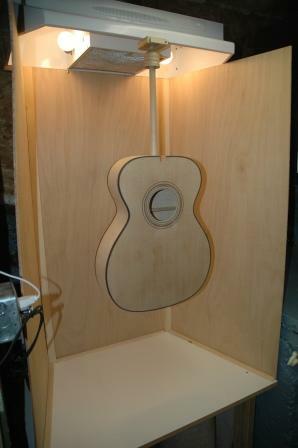 I designed so a dowel attached to the guitar or neck could hang and rotate. Turned out perfect. I’m so clever, and humble. 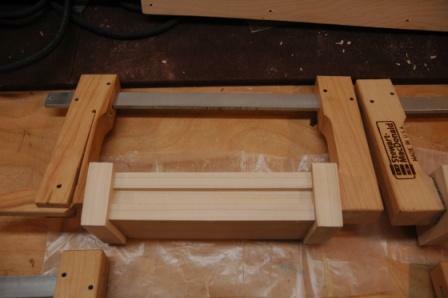 I returned to working on the side bending machine. 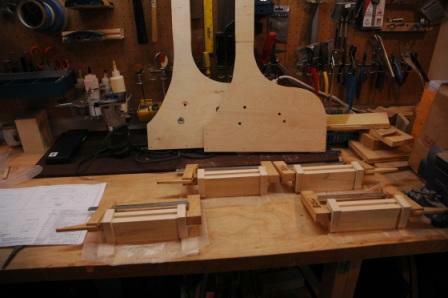 I’m using plans from Luthier’s Cool Tools and referring to pictures from my guitar building workshop with Charles Fox (the purported inventor/designer of the side bending machine). 5 days until Halloween, and 9 days until we regain our freedom. Been working once again on tools. Got plans to build a side bending machine, and have been spending time doing that. As well have been exploring what I should do for Guitar 805, whether it should be an OM or Parlor. 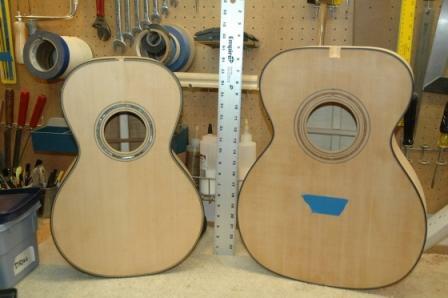 I’m leaning toward Parlor, but here’s a side by side comparison of the two to see the size difference. Used my groovy laser leveller to sight line down the body of the guitar to the end of the fretboard all the way to the nut end of the fretboard, drilled 3 pilot holes in the fret slots and inserted brads to locate the fretboard on the neck. 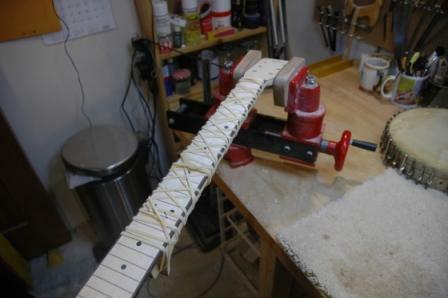 Unbolted the neck, inserted the truss rod, put in the vise, then slathered just enough glue on the neck AND underside of the fretboard, taking care not to apply glue to the truss rod itself, lined up the drillled brad holes and inserted brads then………….wrapped it all up in my 35,000 inch rubber band. There’s a brad in the 2nd fret and two in the twelfth fret slot. 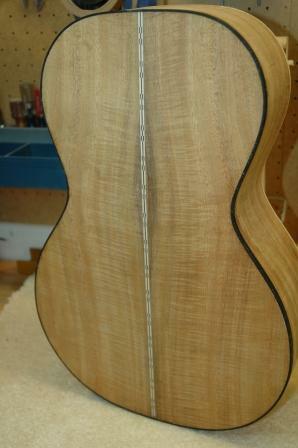 These holes will be hidden once the frets are pressed in. I found a discussion board addressing the topic of when to apply lacquer to the maple fretboard: before fretting or after. Concensus is after. Pulled the tape (and unfortunately, a bit of spruce grain, but that will sand out) and have a top bound guitar body ready for scraping. Just 18 more days until Barack Obama is elected. Wish it was tomorrow. I pretty much completed my workshop remodel on Friday. There’s still a lot of cleanup and organization to do, and maybe Carol will help me with that tomorrow. When I have multiple projects going on at the same time (like the Koa Parlor, the OM Maple, and the banjo rejuvenation) I work on the one that is the most fun. And, I really like putting on the binding and purfling. So even though Tom is wondering when his banjo will be done, and Larry is patiently waiting for his maple OM (which I will call the Hulk), I gravitate to the Koa Parlor as it is in the phase I enjoy the most. 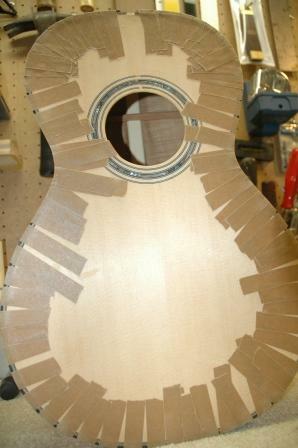 Spent a lot of time ensuring I had the right depth and height for routing the channels, and tackled the back first. Preparing for the gluing is key. Get all those binding tape strips ready, square off the ends of the binding, slather on the glue, and get going. 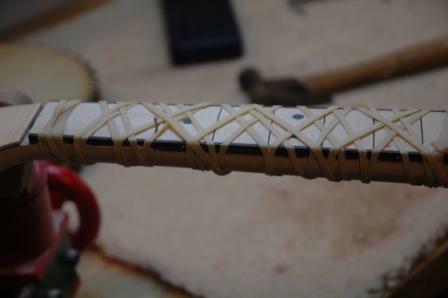 I’m always a bit sore in the forearms after applying the binding tape as the tight fit between binding and body is essential, so I really bear down on the tape as I’m putting in place. It doesn’t need to be taped long, maybe a couple of hours, but I left for at least 4 hours before removing tape. The top is a bit more complicated as it is binding and purfling. 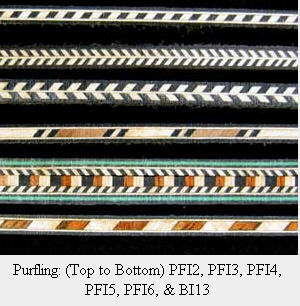 The purfling is the decorative strip between the binding and the top. It requires two channels carefully routed. This side is quite a bit messier than the back, making sure to get all the glue in all the faces that need it: in the channels, between the binding and the purfling. I prefer too much glue to ensure that glue gets everywhere it’s supposed to. I don’t want any gaps, and missing glue spots can allow gaps to open up. Again, taping is more difficult than the back, and keeping up with the drying glue and getting everything pressed firmly together and against the top while pulling down the tape is a bit tricky. Tomorrow, I can remove the tape and start scraping. But….maybe I’ll work on the banjo and the maple OM to keep my boys happy. Guitar 805 – Another commission! Today, the stock market rebounded! I’m pretty sure this was primarily due to the news that Stephen Godbe has received another commission for a guitar. This commission is from an old friend in the Bay Area. He has set a pretty aggressive schedule for me to complete and we are only beginning to discuss the design, woods, and model. We might go with a parlor, but we’ve also discussed twelve string, and I’m wondering if a parlor twelve string is possible. I’ve also been considering what I would do next for myself, now that I have kept my first guitar only for my personal use. I ordered plans for a resonator guitar, and I’m leaning toward that as guitar 806. Whew! Construction in the workshop is complete. I have plenty of cleanup to do vacuuming up the dust and sweeping up the crap I threw on the floor while building walls, installing insulation, wiring for plugs and lighting. I’ve reinstalled the shelving in the new open space and after cleanup, it’s time to put everything back and devise new storage locations for jigs and radius dishes and oversize wood sheets and power tools usw. The ceiling in the new space, which I will continue to call the mezzanine, is the underside of the front porch, so I still need to insert some insulation, and ultimately I want to paint the cement floor and somehow seal the old 1908 cement foundation wall and mezzanine shelf as they emit 100 years of old dirt still shedding off the funky cement (or is it concrete). 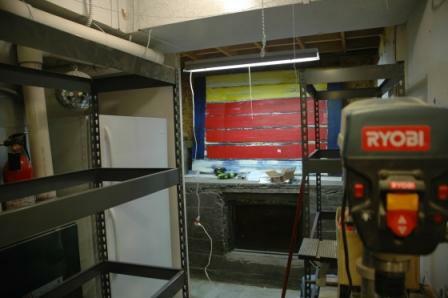 But that I can do at a later date as I start to build the spray booth which will occupy the space previously held by the refrigerator. Speeding through the workshop expansion. Finished wall between “mezzanine” and garage stairs, wired for electrical outlets in the new space, moved the fridge next to the furnace, and installed a new fluorescent fixture in the new area and moved the incandescent fixture out into the garage stairs area. 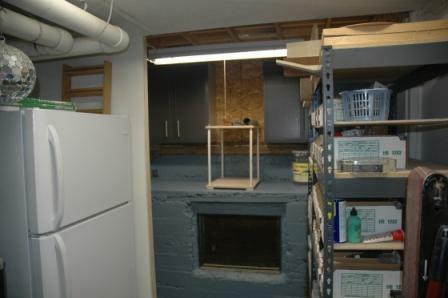 Fridge moved (itself) to space next to furnace, where shelves used to reside. 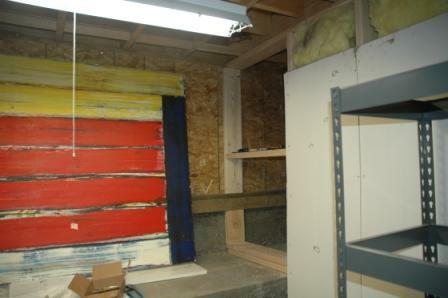 Prior to installing the fluorescent fixture. 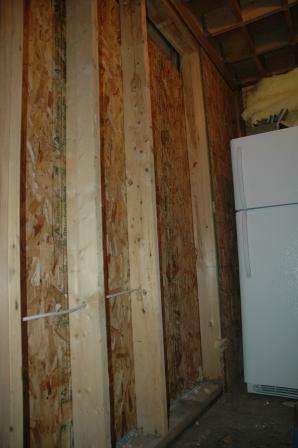 Wall finished, needs insulation and surfacing (probably particle board left over from the tear out). I’m very lucky to have a dedicated shop space for building. My shop is in the furnace room which also houses the water heater. I am using every square inch of space with two workbenches, supply shelves, an old bureau with drawers for guitar supplies, and wall space for hanging up stuff. I really like the limitation as it gives me a chance to be creative about space management: everything has its space, and up until now, there was room for new stuff. 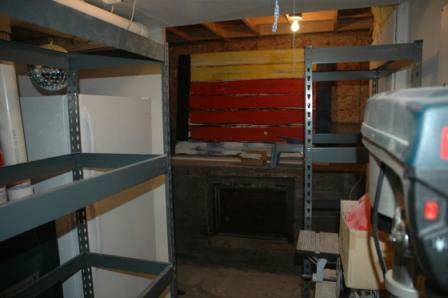 Now I want to build a spray booth, and install a buffing station, and there isn’t an ounce of room left to accomodate. 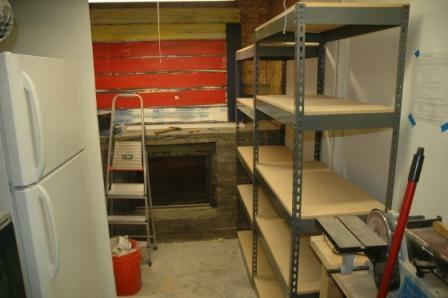 Opposite the shop’s back wall is the “mezzanine”; a space between the garage and the shop. I can increase the size of the shop by removing the wall and enclosing the “mezzanine” where it opens toward the garage stairs. 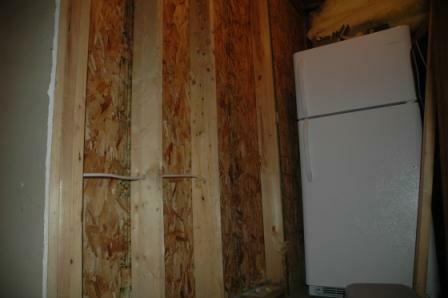 I started removing the particle board on the garage side, and tomorrow I’ll pop out the studs and remove the shop side particle board and sheet rock then use the removed materials to build the new outside wall. The “mezzanine” floor is lower than the shop floor, so I’ll either do a lot of tripping, or I’ll build up a wood floor over the cement to even it out.